Holiday or business trip to New York City? Williamsburg is the spot for the globe-trotting young and hip. The coolest bars, restaurants, galleries and shopping in NYC in one of the most centrally-located and sought-after neighborhoods in the city. 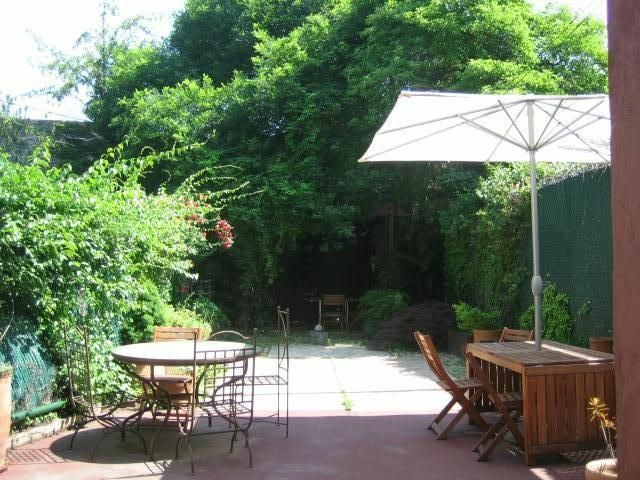 Just 4 minutes walk to famous Bedford Avenue L train station (1 station from Manhattan's East Village). Fully furnished 1800's landmark brownstone Floor-Thru Garden Open Loft-like Apartment with Jacuzzi bathtub, gorgeous Wood Floors, original exposed beams, filtered water, full Kitchen, free laundry, free wi-fi internet that opens onto a serene huge Brooklyn Backyard Oasis with organic herbs, flowers and hammocks on a quiet and safe historic street in the heart of it all. You are literally just steps from everything in the neighborhood (markets, bars, restaurants), and you are closer to downtown Manhattan (Soho, Village, Tribeca), than if you stayed in Midtown Manhattan. 10 min to Manhattan on the subway including your walk. We are 1 block from the Apple Store, 1 block from Whole Foods Market, and just a half a block from CitiBike Rental. Further Details: This very comfortable apartment sleeps 4 people and has a microwave, toaster, coffee maker, hairdryer, ironing board, air conditioner, heat, plus a laundry room- all included. Things To Remember: 1. ABSOLUTELY No Smoking & No Drugs. 2. THERE IS NO TV. This is not a hotel room, but a meticulously cared-for, extremely cozy apartment to relax and feel at home in. 3. ENJOY the backyard, the flowers, the hammocks, the hippest neighborhood in NYC and unbelievably easy access to Manhattan. As shown in the pictures (taken in summer of course). Opens out onto the garden patio as shown in pictures. This very comfortable apartment sleeps 4 people and in addition to the amazing backyard garden oasis, has a jacuzzi, microwave, toaster, coffee maker, hairdryer, iron+ironing board, air conditioner, heat, washing machine and dryer--- all included! We enjoyed our week long stay in this apartment. We are a family of 5. We bought a nyc transit metro pass and went into Manhattan each day. Super quick. Apartment was clean, comfortable & well equipped. Host was friendly, responsive & knowledgable. This Brooklyn neighborhood was full of shops & restaurants. We would stay here again. We had an awesome week-end at Daniel’s cosy appartment. Everything was as exspected: Daniel very helful, studio very clean and confortable even for our family with our three kids. Great Location in the heart of Williamsburg, easy access to all public transportation. Highly recommended. Very attractive and right where we wanted to be! I thought it was a very nice apartment, aesthetically pleasing and very comfortable...also, very close to the restaurants and shops of Williamsburg. The subway wasn't far and then only minutes into Manhattan. There were four of us but the room was quite large and the fold out bed was extremely good, very comfortable. Our host was great. He always replied quickly to every communication, before, during and after the trip but he was never intrusive. When we got back to California my friend thought she left something and got in touch with Daniel. He replied almost instantly. She and I agreed, he was a terrific host. Williamsburg: The best of Brooklyn and easy access to Manhattan. I can't say enough positive things about our recent stay in Williamsburg. From my first contact with Daniel and all through our stay, he was so helpful and the apartment had everything we needed. We were so pleased with our decision to stay in Brooklyn even though we had plans in Manhattan: plays and museums. The train into the city is close by and quick, plus a couple of days we took the ferry. The area around the apartment had nice restaurants and shopping within walking distance. We'd definitely stay at this location on our next visit. Great place! Very comfortable and close to so many parts of Brooklyn! This ground level apartment served our needs perfectly and Daniel could not have been a more helpful host. Spacious for NYC!, and because it was a chilly Thanksgiving week, we didn't even use the backyard. Had 10 over for dinner - all cooked in the very complete kitchen - and it worked fine. We expect to return. Williamsburg is NYC’s most vibrant cultural hub and the center of the Brooklyn Food and Art scene. Teeming with artists and young professionals, the neighborhood is overflowing with artisinal cafés, galleries, gourmet coffee roasters, chocolate makers, micro-brew tasting rooms, fashion designers, cutting edge music venues and a zillion delicious restaurants offering: japanese, artisanal pizza, malaysian-peruvian, thai, turkish, vietnamese, middle-eastern, polish, mexican, french, venezuelan, korean, argentinian, southern barbecue, american bistro, burgers and authentic italian enotecas, etc.